Welcome to Cutlery News Journal. Thanks for taking the time to check it out. CNJ provides you with all the latest goings-on from the knife collecting world- all bite-sized and easy to read. I’m Scott King. Many of you know me as the host of ElephantToenails.com. I started ET.com for toenail collectors to have a resource for that vintage knife pattern. Cutlery News Journal, on the other hand, is for all knife collectors and users. I think you will find CNJ balanced, yet chocked full of interesting cutlery related tidbits. In the 1990s, I started a knife e-newsletter called TidBits. Then I launched The News, a blog for antique toenail collectors. I am also a freelance writer and blogger on knife collecting, cutlery company history, the use of technology to advance our hobby, and computing. In early 2009, I founded iKnifeCollector– a social network for knife enthusiasts. My real job is the real estate auction business. 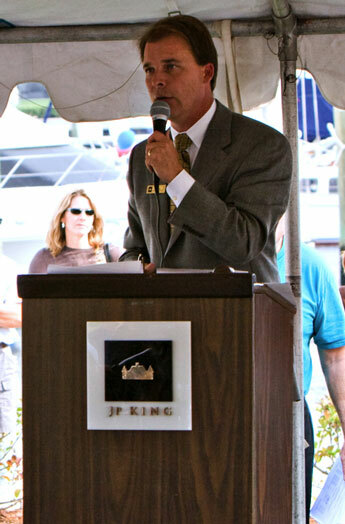 I am a fourth generation auctioneer. And while we don’t auction knives, I have been invited by the W. R. Case & Sons Cutlery Company to be their auctioneer for two different events in Bradford, Pa., and, of course, I quickly accepted. Due to the time I spend with my family and work, I don’t get to travel to many knife shows and this has motivated me to develop web-based resources for knife collectors. Hope you enjoy CNJ and come back often. Feel free to contact me. If you are a knife collector, please check out iKnifeCollector. It is the fastest growing knife collector community on the web today. Lots of nice knife folks- of all ages and knife interests. Hope to see you there.